(Finland) The country which gives the student 400 Euros per month. It seemed that I was going to the south. There was less snow on the road and the tree. 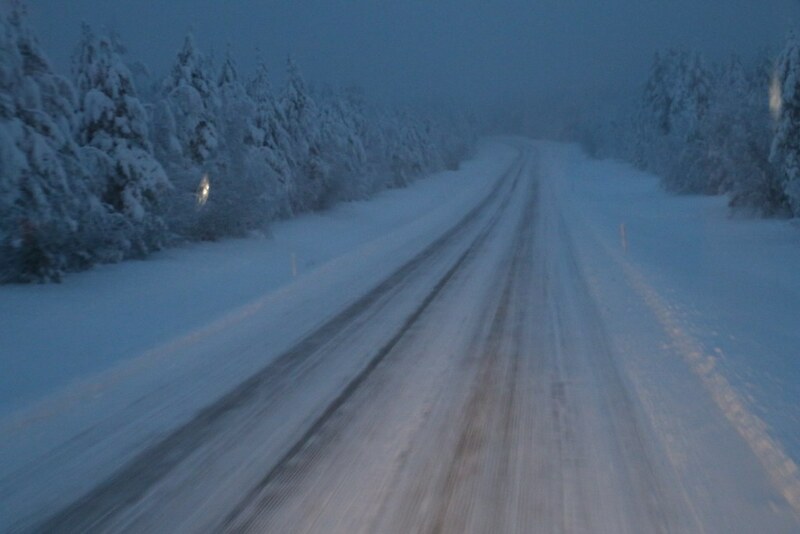 I missed a beautiful road with full of the snow. I was wondering what the sign means on the picture. Later I realized that it meant there is a speed camera. 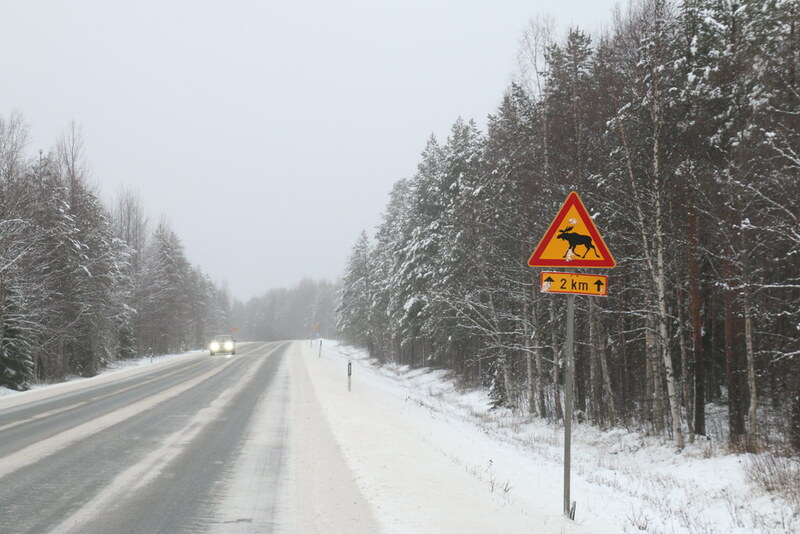 As going to the south, there were many signs of warning for moose. So, where is moose? Show me! I would love to see!!! I didn’t understand the first sign at the upper on the board. I found out the meaning on the map that it means there is an attraction. 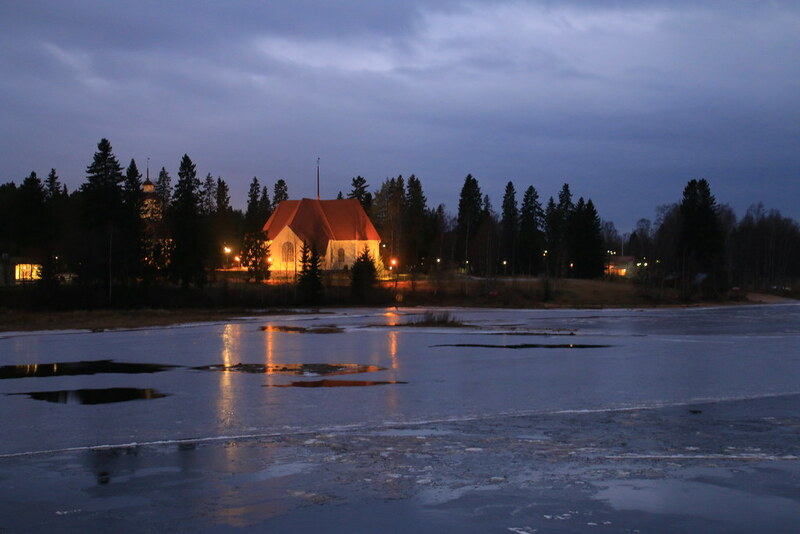 Rovaniemi is one of the most famous cities to a traveler in Finland because it passes the line of Artic Circle and it has Santa Claus Village. I decided to stop to say hello to Santa. There was a post office. 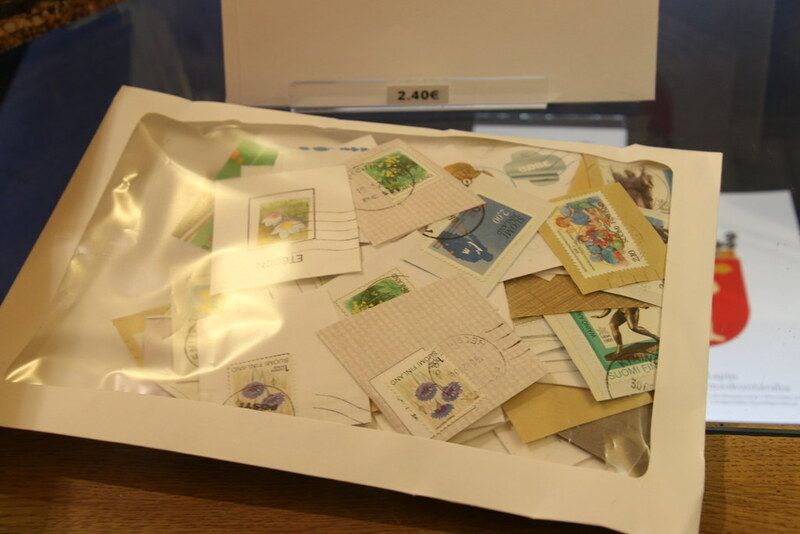 They sold old stamps they collected from people. I just bought a few new stamps. 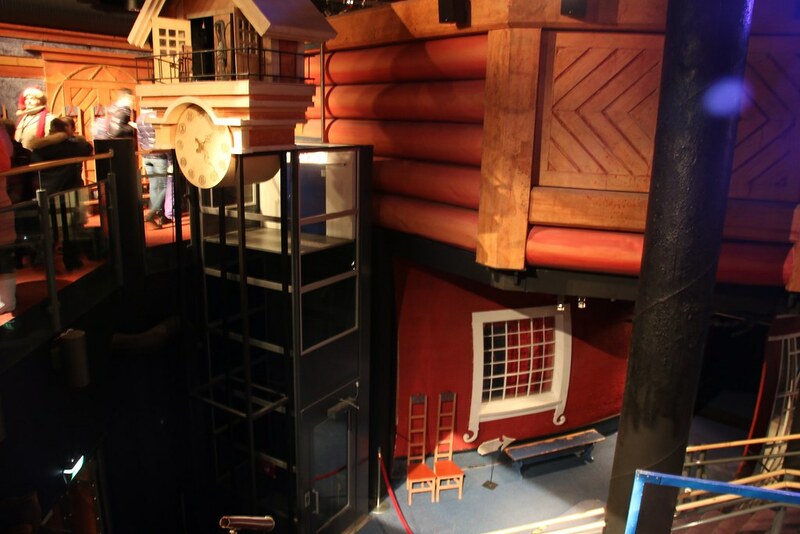 Finland is widely known as Santa Claus’ country. I was wondering why people believe like that. A long time ago, so the story goes. A Finnish radio speaker told in the 1920s a story about Santa Claus living near Korvatunturi, an ear shaped mountain. On this ear shaped mountain Father Christmas was able to hear the Christmas wishes of all the children in the world. Later some tourism started into that area, which was not good for nature. 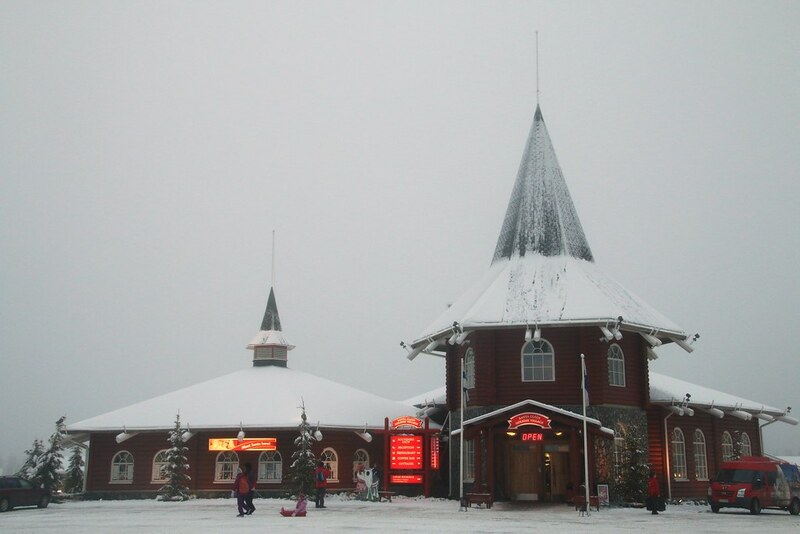 So someone invented the idea, that Father Christmas has an office at the Polar Circle. And now you can visit him in his office in Rovaniemi. So, the thing is the government and tourism developed Santa Claus’ story very well as business. There is also Santa Claus in Korea. But I think I’ve never met Santa Claus in my life. I don’t know why. There was a tourist group that I had to wait one hour to see Santa. Finally in my late 20s, I met Santa. I was very nervous to say Hello to him. 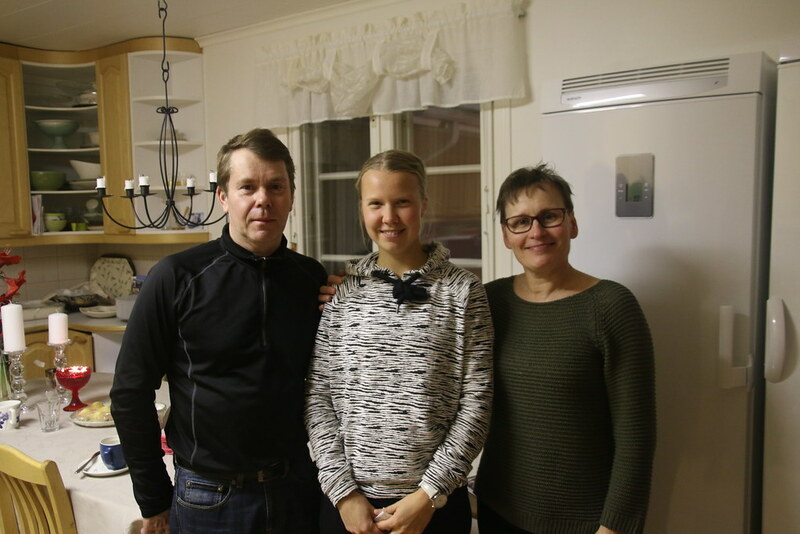 Marja who gave me the place to stay in Ivalo introduced me her parents that I had a place to sleep in Rovaniemi. Just in time, she and her husband visited her parents so we could meet again, which was really nice. 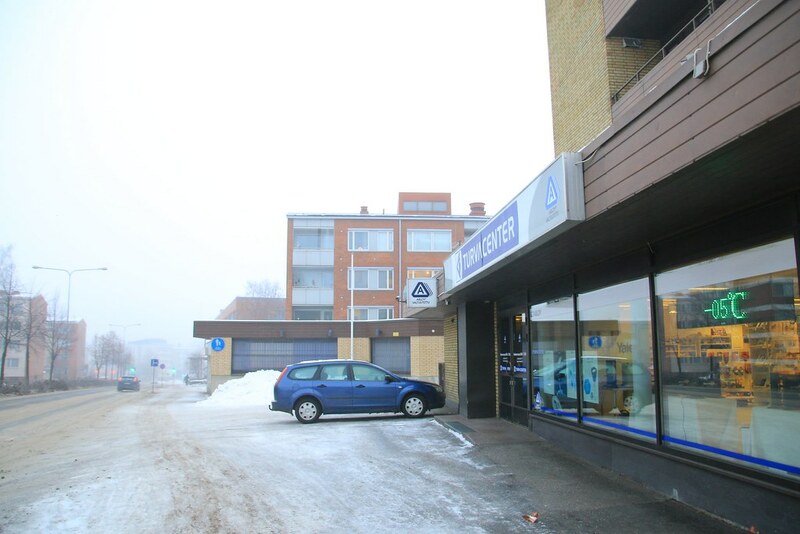 At the next day, just before getting out of the city, I visited a grocery shop. 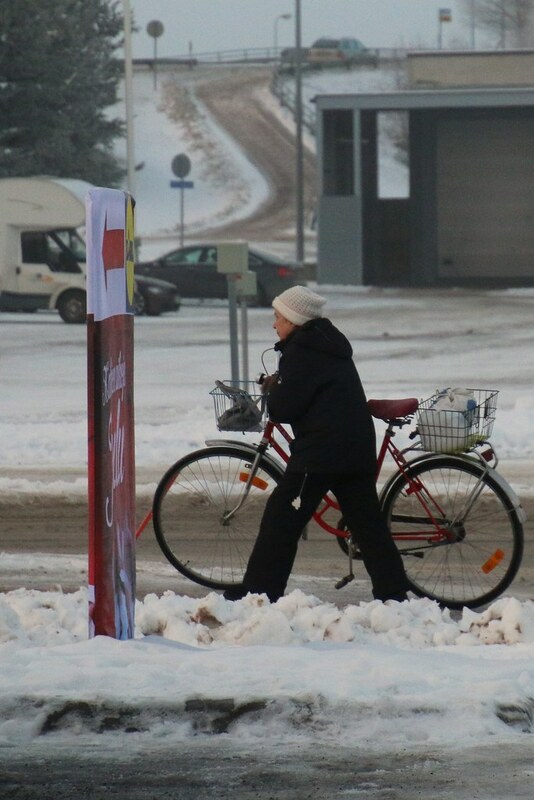 Although there was the snow, an old lady was having grocery with her bike. 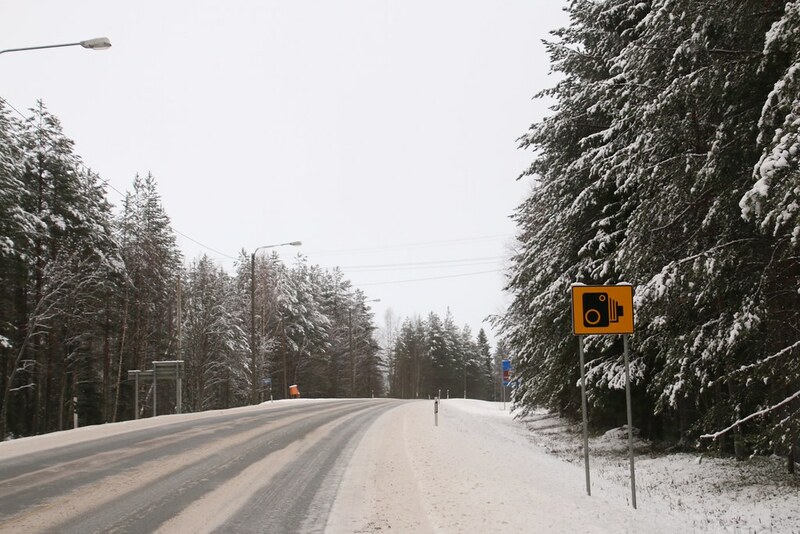 It seemed Finnish do not care much about cold snowing weather. 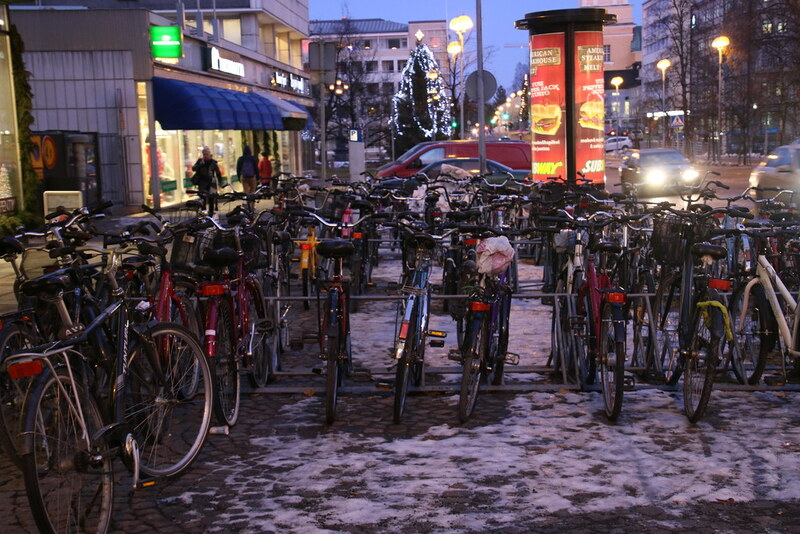 There were many bicycles in front of the mart. 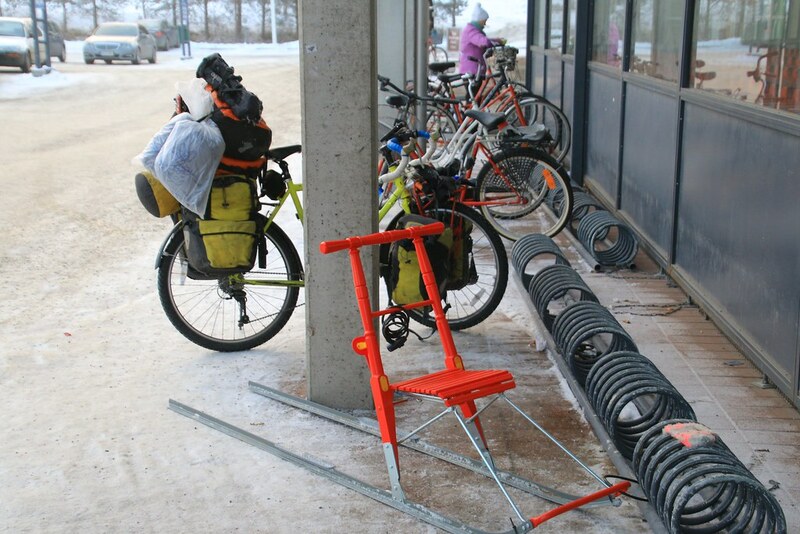 Even there was kick sled which is very popular in Finland. 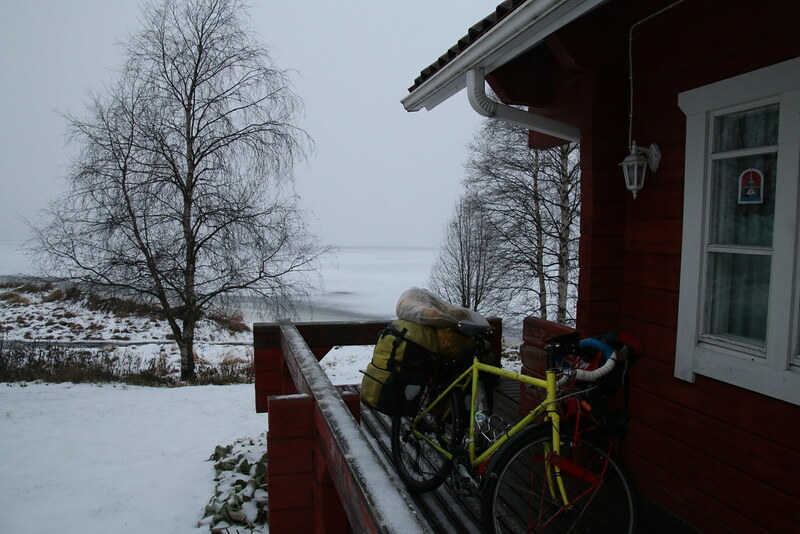 It took much time to get out of Rovaniemi, because I had to find a bicycle path to avoid a motorway. 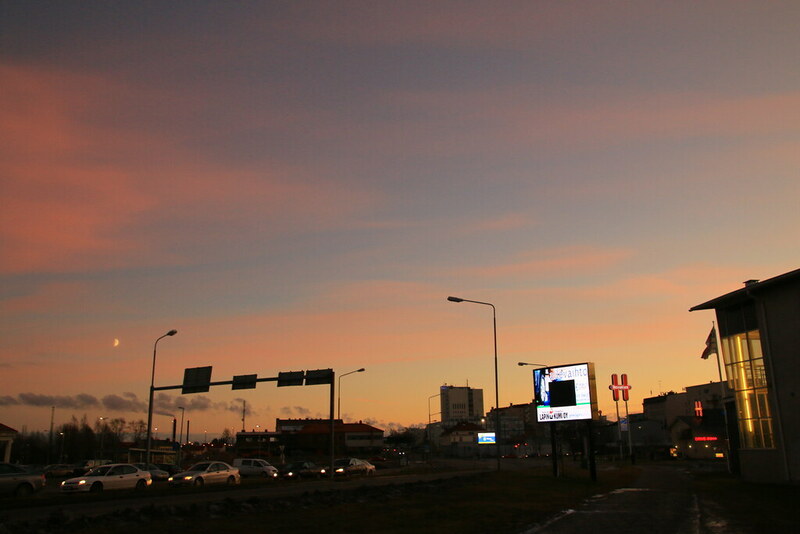 Today the weather was -5c (23f). Just before making 40 km (25 mi), the darkness came. 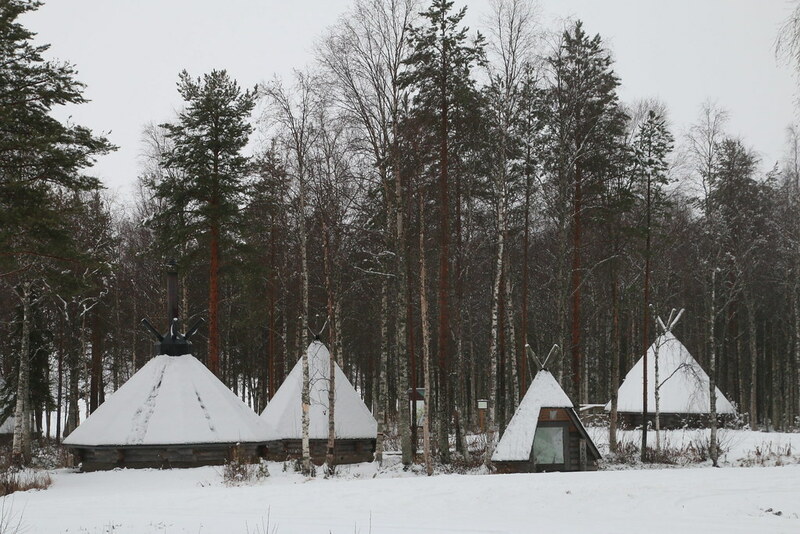 I was kept denying for setting tent at their garage maybe because I was totally out of Lapland. I saw one big house on the way. I hesitated to ask there because it looked so fancy hotel. Later I heard that the owner of that house is the one who has the biggest business at Santa Village. After denying many times, it was totally dark and I was being nervous. Thanks that kind family invited me with a big smile. Actually they didn’t speak English, but they understood and saved me from the cold night. The center of the picture is their goddaughter who came later. She spoke very good English that I could hear many Finnish things from her. I was so shocked that she, a student in Finnish university, gets 300~400 Euros per month from the government except vacation month. Even they get money for renting room that they only pay 30~40 % of money for renting. 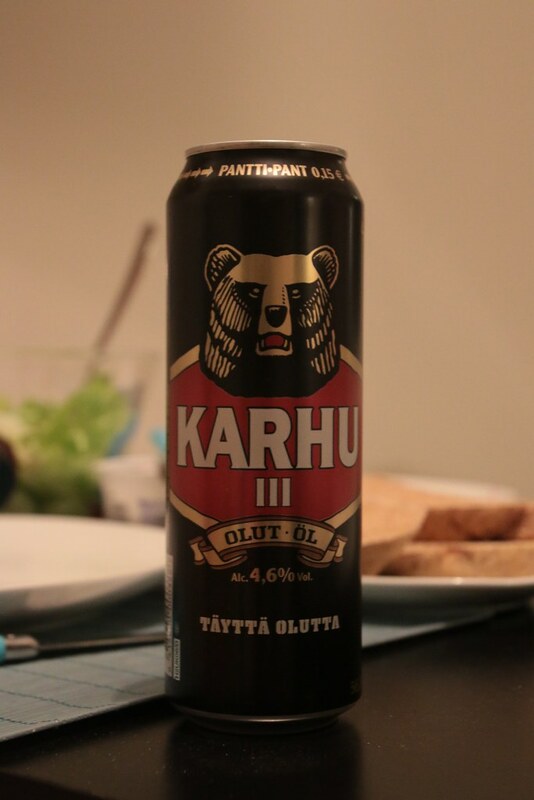 In Finland everything is expensive. But I think there is one exception that renting is quite cheap. 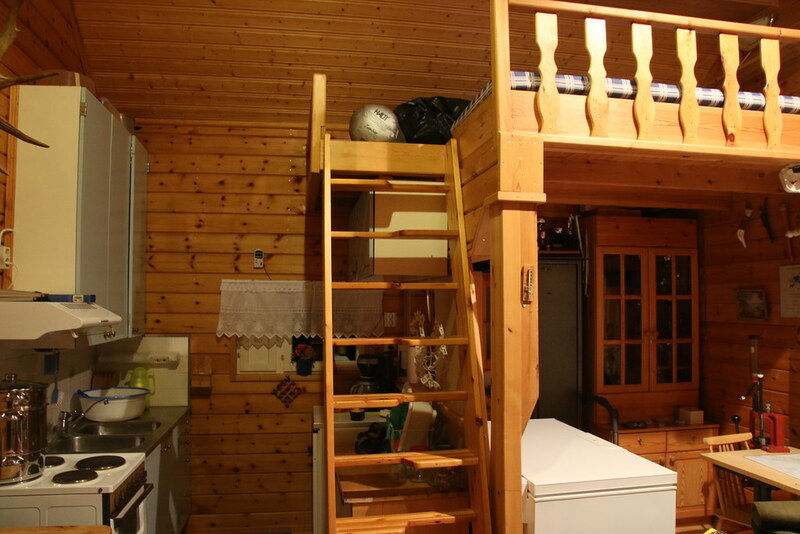 It is only 270 Euros ~300 Euros for renting room. The students usually pay 70~90 Euros and government pays the left one. I screamed out when I heard this one from her. She said the government sent a mother Maternity Package when a mother get a baby. What a lovely government! Even from 0 to 17 years old, the government pays to parents about 100~130 Euros for children. 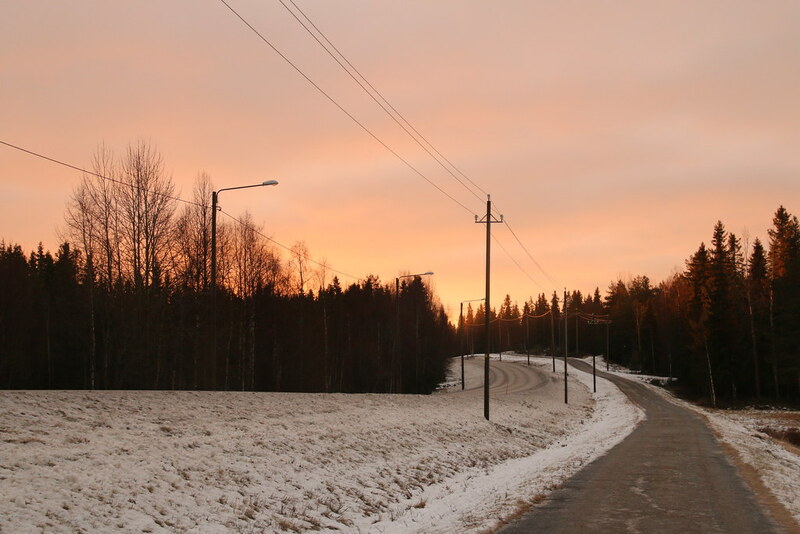 I heard that unemployed got 500~600 Euros and house benefit from the government in Finland. But she told me that she never wants to get unemployment benefit. She said she must get a job after graduating. Right now an unemployment rate is high in Finland. Some local people criticized that Finnish government does not care about much to make more jobs, but more care about to give money. In Finland before and after childbirth, parents can get Maternity leave and Paternal Leave for two or three months and they get some money. American, Latin American, African, and European I’ve met are shocked when I talk about this of Korea. Korean summer vacation is only four or five days. WHAT??? How come can I travel Canada from Korea for four days??? I really didn’t understand their question. Later I realized that their vacation is usually two to four weeks for summer holiday. I found out that many of Korea live like working robot. We are brainwashed that we must work hard and if we have a long vacation, Korean companies will have crisis. Korean economy developed too suddenly during dictatorship and it made too much problem in the society. Korean are suffered from violation of human rights. Many Korean people envy the welfare state like Finland. So, then Finnish whom Korean envy are the happiest country people in the world? It was shocking that actually Finnish who have lots of benefit from the government ranked at sixth on a suicide rate while Korean who don’t have much human rights ranked at the first. 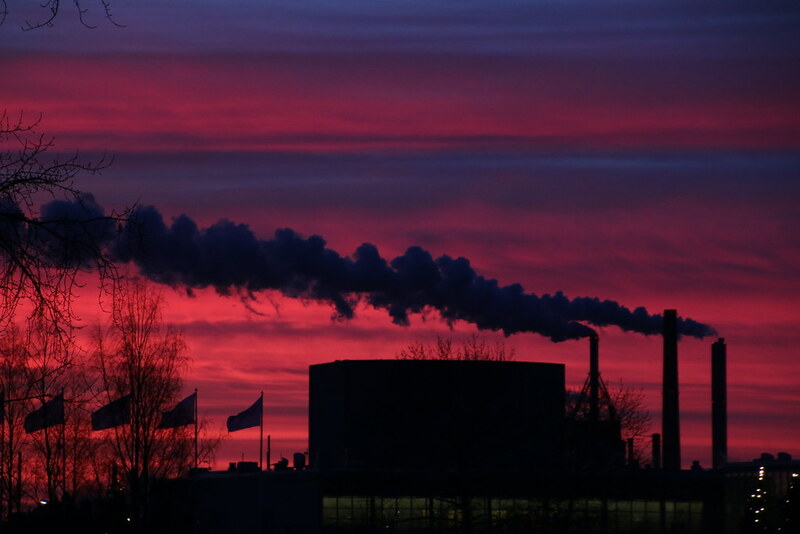 I was wondering what made people commit suicide in Finland. Other European describe that Finnish are quiet person. One European who lives in Finland told me that it is hard to communicate with Finnish because they do not appear their feeling. I actually asked many local Finnish about this judgment. Most of Finnish agreed their reputation about it. So I think the reason why many people suicide in Finland is actually from cultural thing. 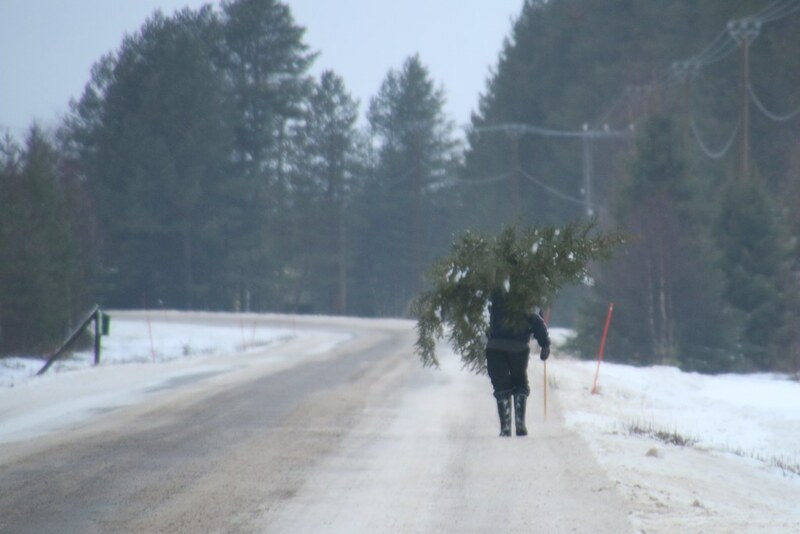 Some Finnish people like their privacy life and love to stay alone. But it brings very dangerous result. 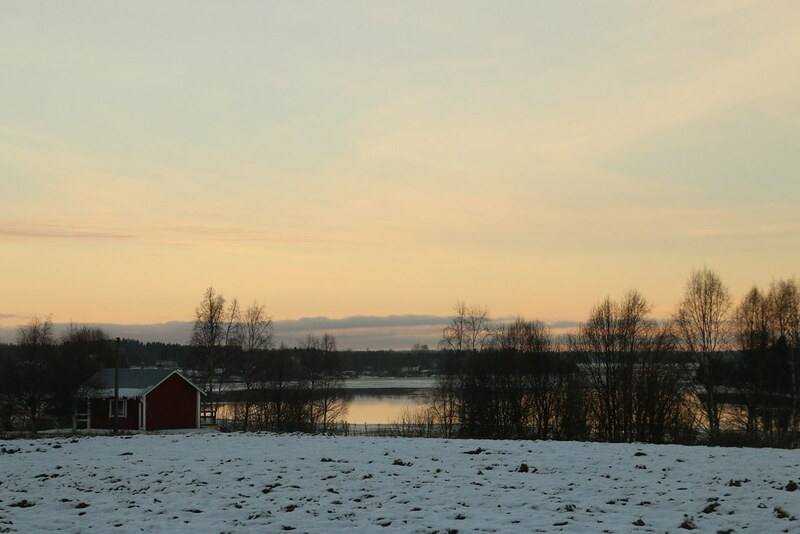 Finland is located at high northern latitudes and half of Finnish land has polar night in the winter which has only 4 hours day lights. It made people depressed and showed tragic result. Then how about Norway and Sweden which are located at the same latitudes? Their suicide rates is lower than average of OECD. Then why only Finnish has this problem? Some local people told me that Swedish is too talkative. So in my opinion, people cannot live alone and specially to love staying alone in the dark winter can bring dangerous situation. Another opinion is to have lots of benefit cannot ensure people’s happiness. Everything must be harmonized. Then what is a good condition for happy life with family and neighborhood? 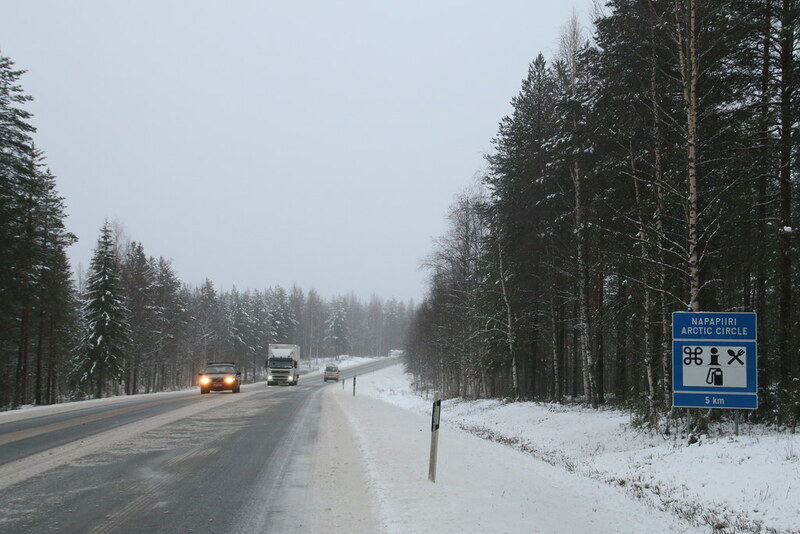 I got out of Lapland and was heading to South. Today I was denied all the time. 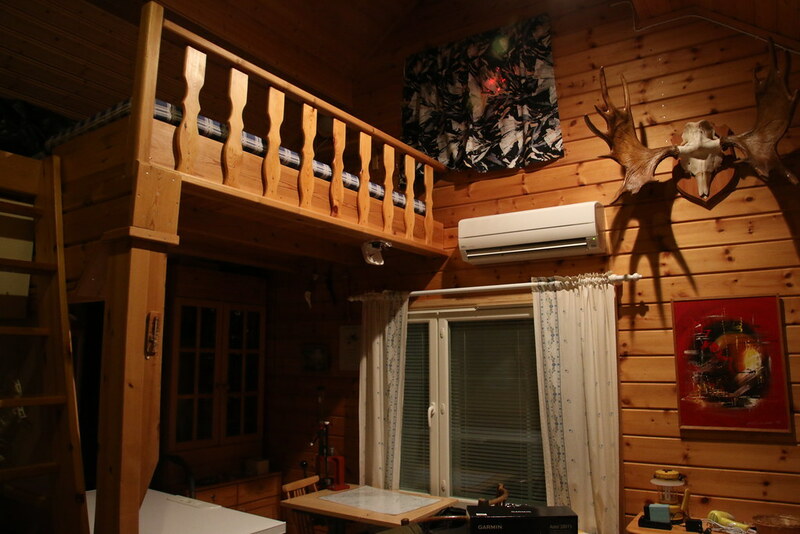 Later night, one old couple let me sleep at their summer cottage. It was quite weird that there were too many flies in the cottage on the floor and sky. Some local people told me that it is not usual thing. I was careful when I cooked pasta. I went to a bed with hearing of flying. 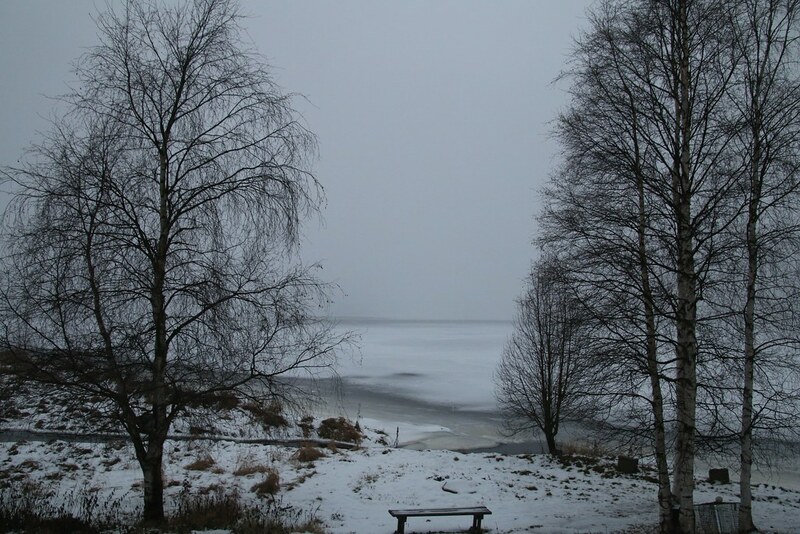 I arrived at very dark last night, so I could not see the landscape in front of the cottage. 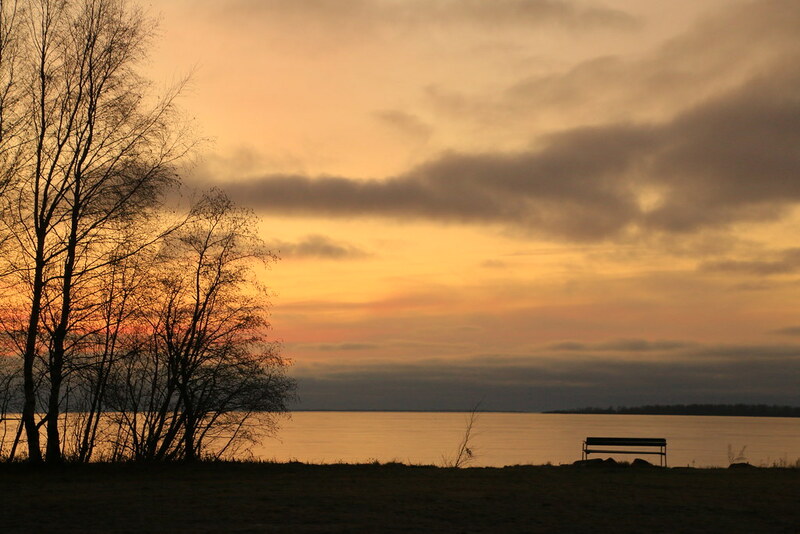 In the morning I could see a beautiful lake view. 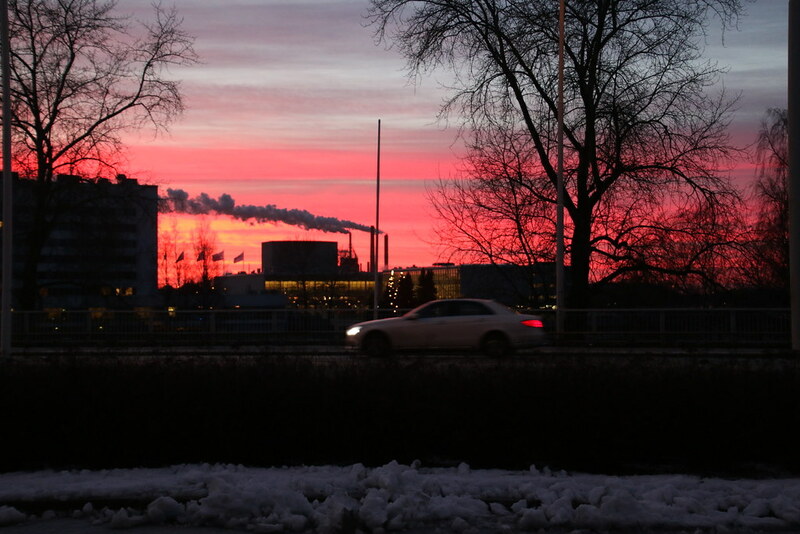 It was very impressing moment to see the red light. 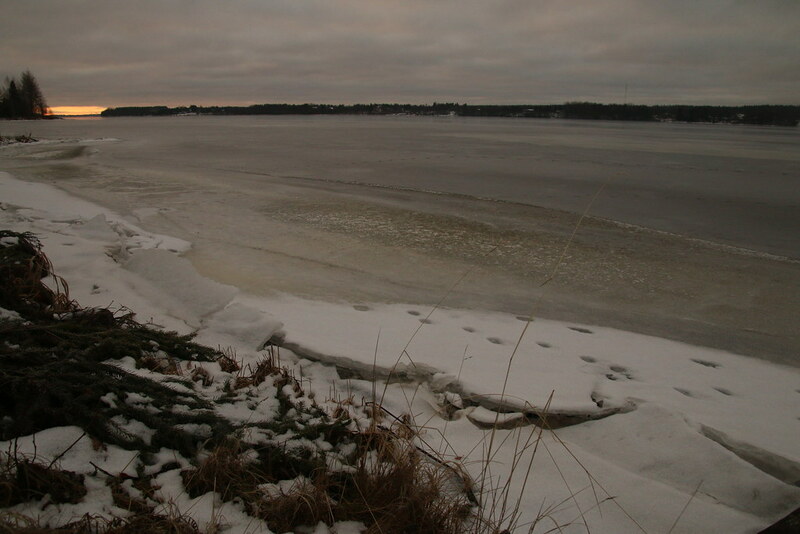 Some of lake was not frozen yet in the south. There were small houses in front of many houses, which are used for bbq. The trace of fox; How fox could know it is safe to walk on the lake. I’ve seen often this kind of house at the farm. Maybe it is for storing farming tool. Around two and half at the afternoon, I could see the strong red light. I felt like my eyes would be burn soon with the beautiful light. It has been long time to see the sunset because it was mostly cloudy. 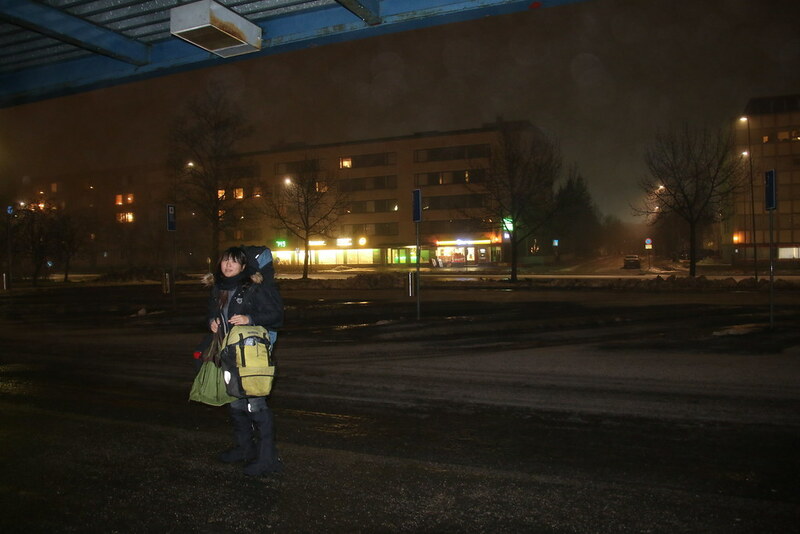 I arrived in Kemi which is a quite big city to me. I had the time that I looked around the park before meeting a host. I already contacted to the host via Couch Surfing that I did not worry about the place to sleep tonight. My host and her roommate were from Slovakia and Switzerland. Two of them worked as Au pair in Finland at the first year. They have lived over three years now. An au pair is a domestic assistant from a foreign country working for, and living as part of, a host family. Typically, aux pairs take on a share of the family’s responsibility for childcare as well as some housework, and receive a monetary allowance for personal use. I’ve met many European who have done Au Pair. But I’ve never checked the website. Maybe those two website are the famous one? 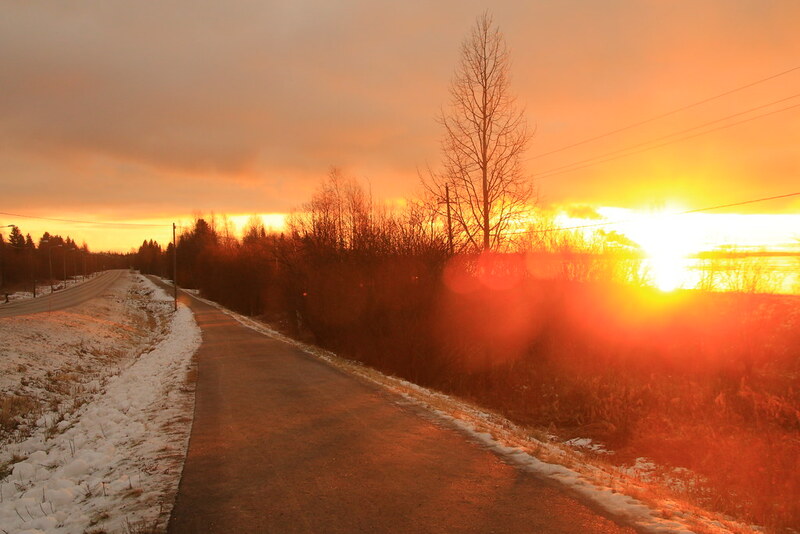 At the next day, when I got out of the city, I could see people were running and cycling. 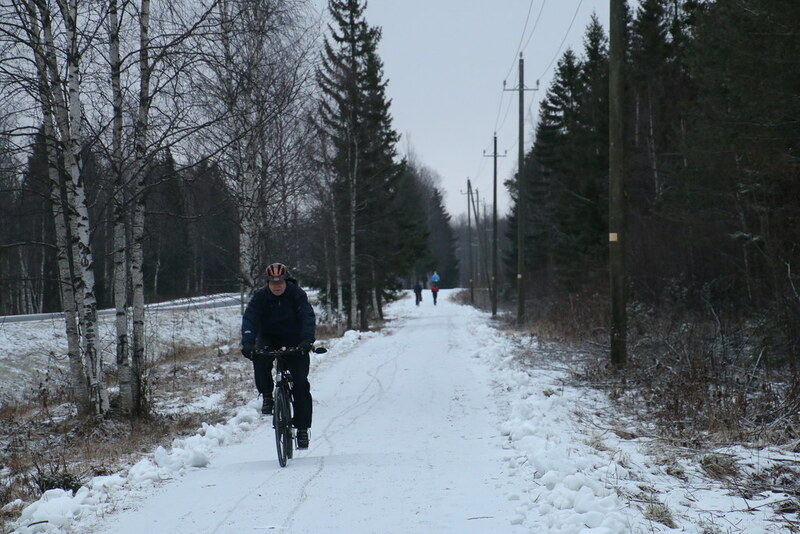 Usually other country’s people told that it is too cold to go out for exercising in the winter which was much warmer than Finland’s one. 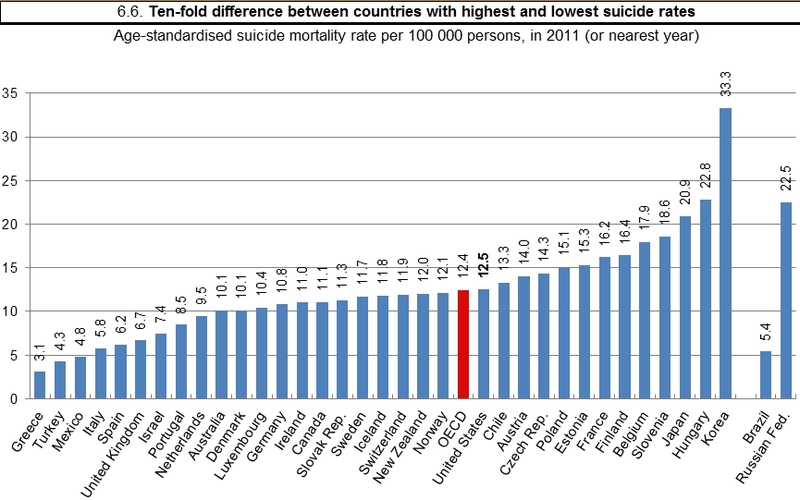 It was weird to me that the rate of suicide in this healthy country was high. The more I thought about it, the more I was sure. People cannot live alone for a long time and specially in the winter. Everything should be in harmony. 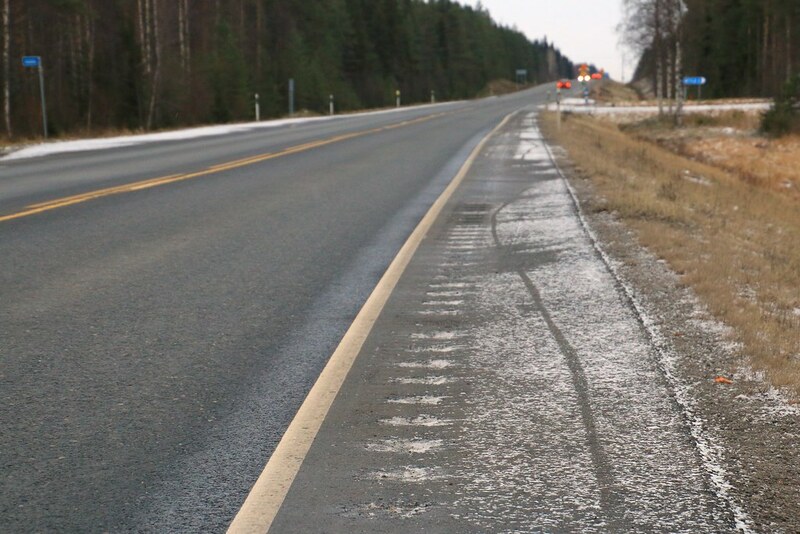 I saw a bicycle track on the shoulder. I was wondering there was someone in front of me. I kept following the line on the snow for a long time, but I could not catch any one. What a disappointed. If it was in the film, there must be handsome hot guy! Tonight I was invited at local people’s house again. 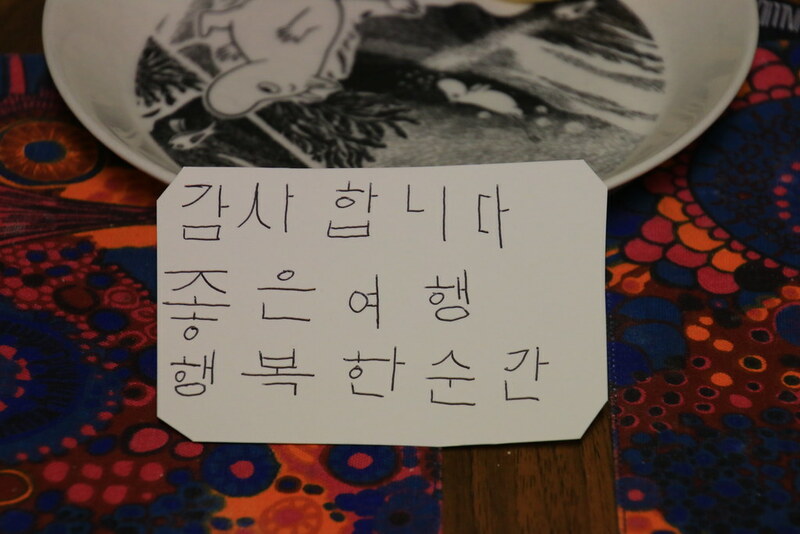 At the next day, I got a letter in Korean. It was my first time to get the letter in Korean from foreigner that I was moved. Thank you so much!! At the next morning I found the same track again. WHO ARE YOU!! At the afternoon I could see children going back home. There were two shocking things. 2. 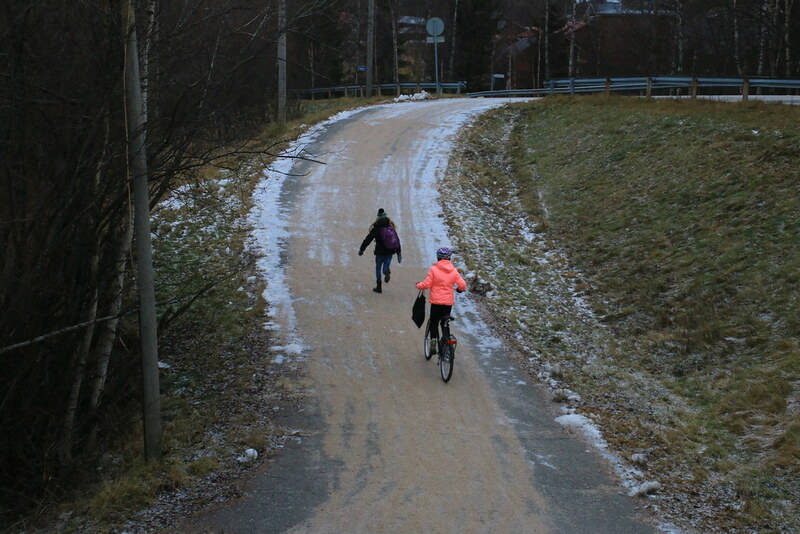 They cycle in this cold weather on the snow road. 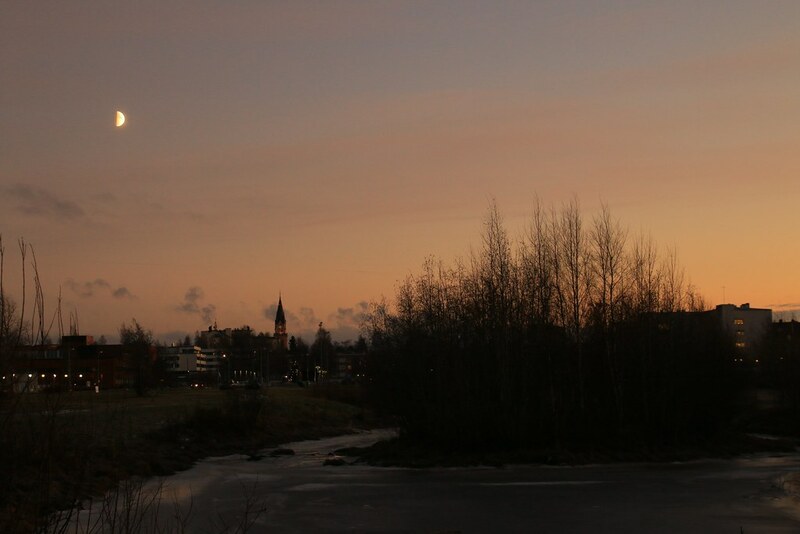 I arrived in Oulu after darkness around 4 pm. I was supposed to meet the guy I’ve kept in touch for months on online. He invited me at his family house. What a special time! I sent him, Rolf, a message to notice I am almost there at the place I found WiFi. Then he found me on the road. I asked him how he could guess where I am. He said it was so easy because there is only one way to his house. He had a very good debit card which gives card holder free hot chocolate every day in some grocery. Thanks to him, I had a hot drink and could see local kids. It seemed nobody worries about seeing children hanging out in the darkness at below zero. Maybe it means Finland is so safe country. Rolf showed me a very special box. He got the box when he got the first baby. There were many things on the box for a baby, he said. 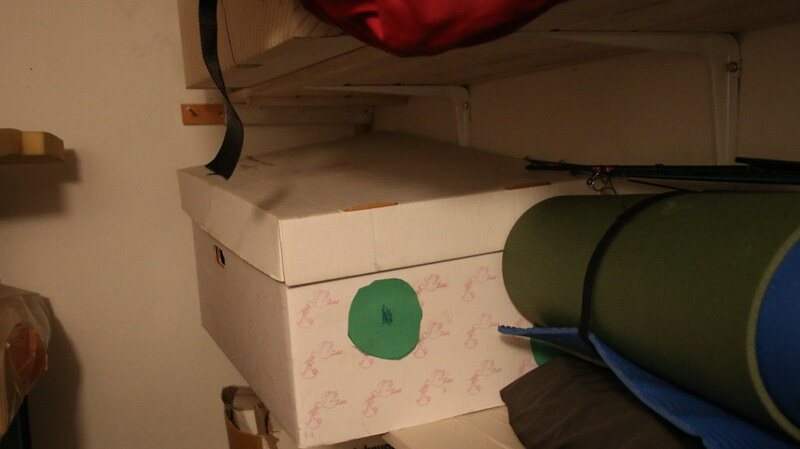 He applied money when he got the second baby, because he didn’t need the box. Every year clothes and things are changed in the package. When people ask not the package, but money, then they get less money like 300~400 Euros. Actually it costs much money if people buy like this. 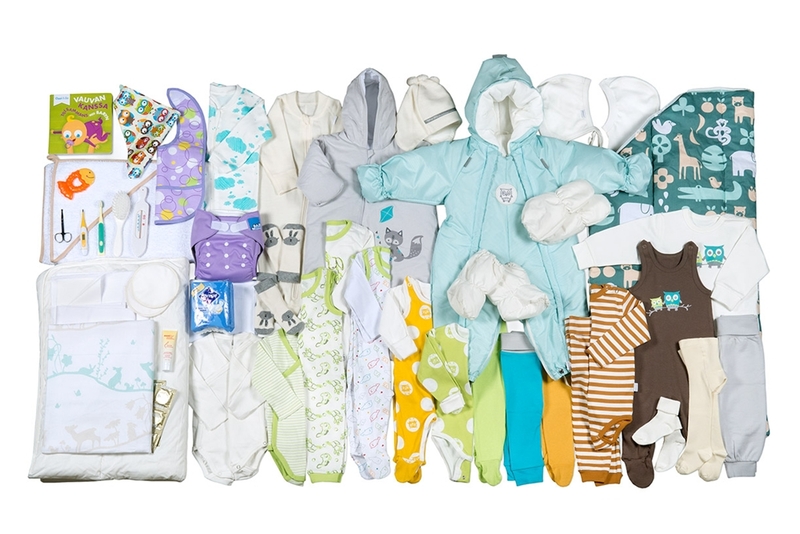 It is said that the maternity package is not a commercial product and therefore they cannot sell it. 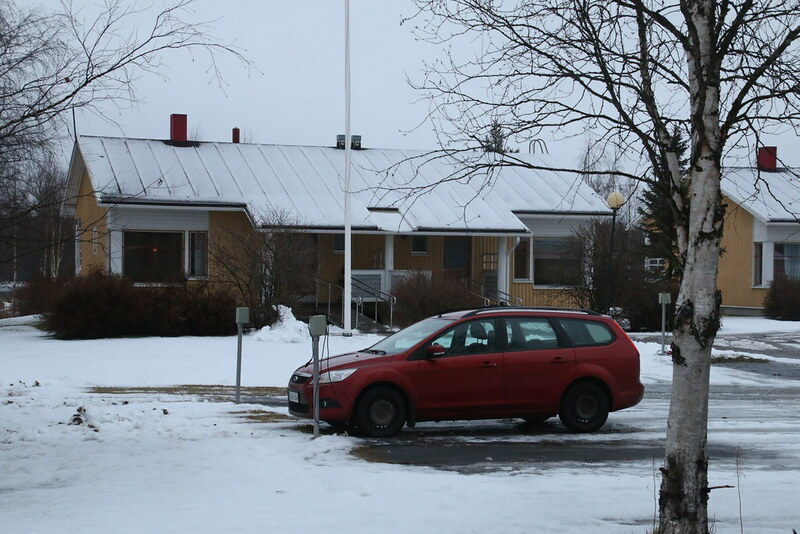 I’ve usually stayed at the house of the middle-aged in the northern Finland, so I didn’t know well about Finnish family. As I kept going to the south, I could see usually people have two or three babies in the house, which is quite lot compared to South Korea. Maybe it was because the government takes care of family. Like this, then who doesn’t want to have a baby? Finnish pay 20~23% tax from their income (A lower class pays only 10%). Korean pay around 13% tax from their income. 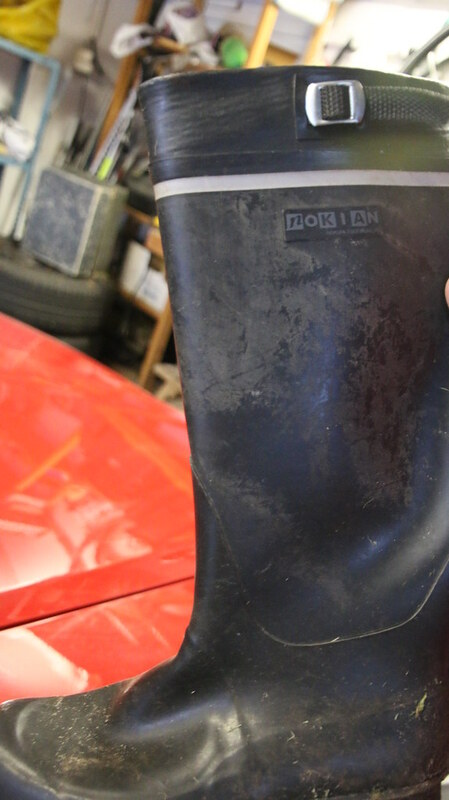 At the beginning, Nokia was selling lubber boots. Actually they are still selling. Rolf told me that there is an astrophotography in the center, who takes the picture in the city. He showed me his website. I could not understand how come he can take this amazing pictures in the city. 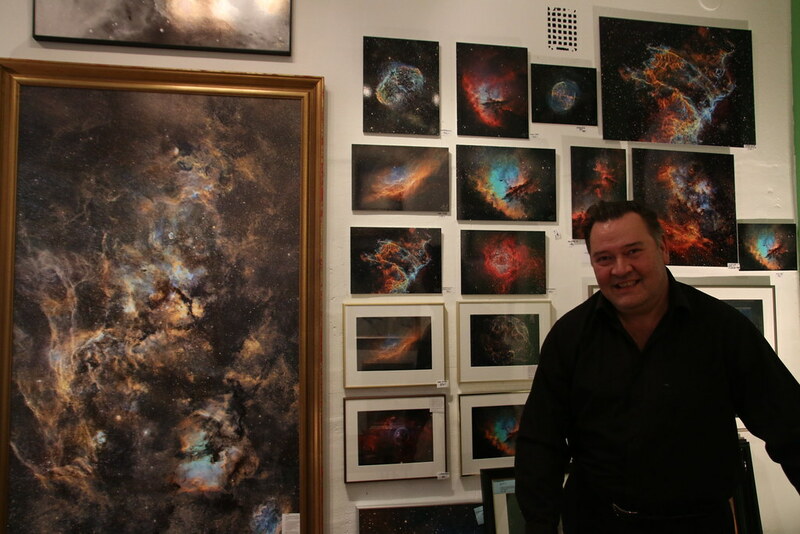 He was at the third at Astronomy Photographer of the Year 2014 from the Royal Observatory Greenwich. Right now he opened a gallery, so I decided to go there. It was a small gallery, but I was impressed. I was wondering so many things, because I’ve never taken this kind picture except only one time in Korean observatory. His name was J-P Metsavainio. He was very kind to answer my question. He didn’t change the color of the picture with Photoshop. He said it is the universe’s original color and it made him passionate to the universe. So, I think he and I are different, but the same. The same thing is we love the universe. The different thing is I love the universe, because I want to travel there. He loves the universe, because it is so beautiful. He started to take professional pictures a few years ago. 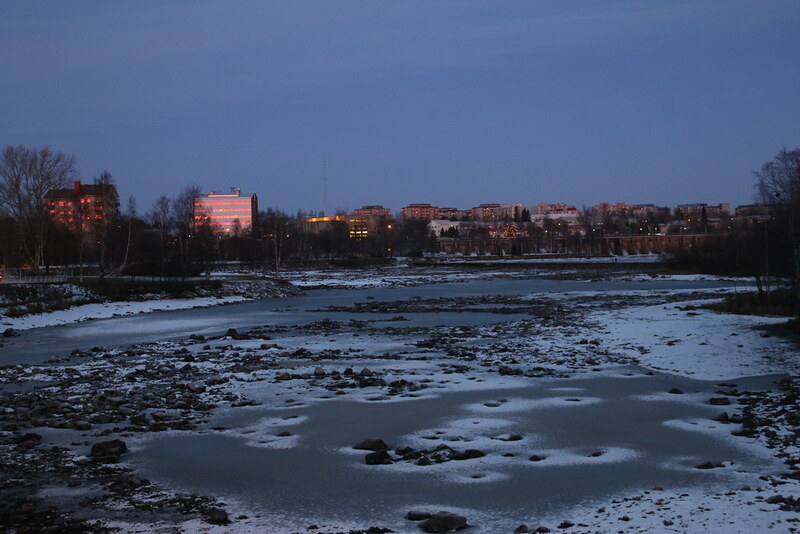 I asked why he is here, because there are so many places which don’t have city light pollution in Finland. He said city light pollution is no problem because he can remove as using special filter. 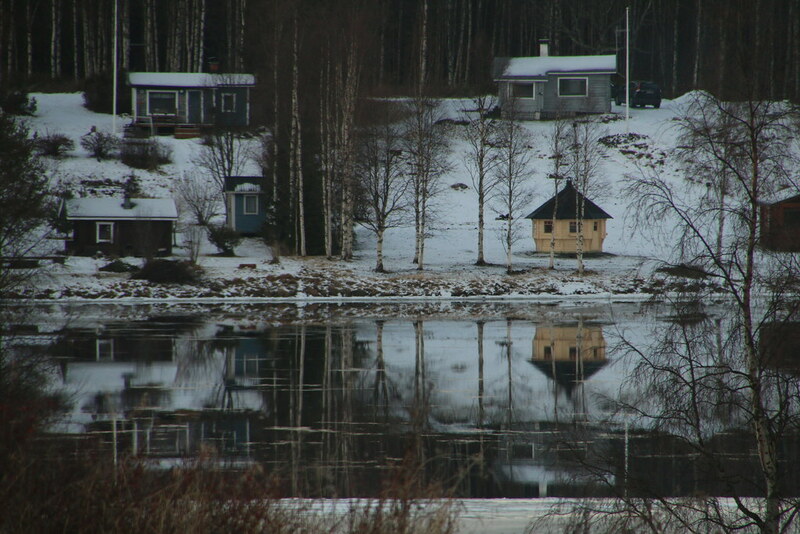 The problem is reflection from the snow, too long day time in the summer, and cloudy weather. So the best season to take picture is the spring and autumn. I was seriously wondering why then he is in Finland? It looks like Finland is not a good place, because clear night sky per year is much less than any other place. He said his family is in Oulu and his wife and he works in Oulu. He cannot make enough money from the astrophotography, so he has other job. The astrophotography is kind of his hobby, he said. Recently he got big sponsors from the richest persons that he can use the big observatory (In Texas? Or Mexico city? I cannot remember well.). There is a huge observatory and five rich guys are sharing. They let him use it for free as supporting his passion for the space. Actually it costs 500$ for one hour to use. (And usually it takes for hours to take one picture.) He can use this observatory through the network, so he doesn’t need to go to the U.S. What a beautiful story I’ve ever heard. It was my honor to meet him. 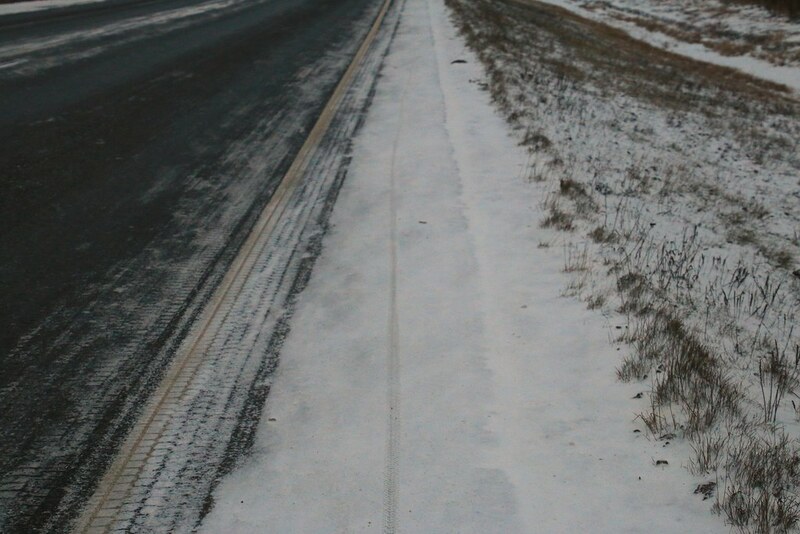 Although the weather was below zero and there was icy road, I could see lots of bicycle on the center. 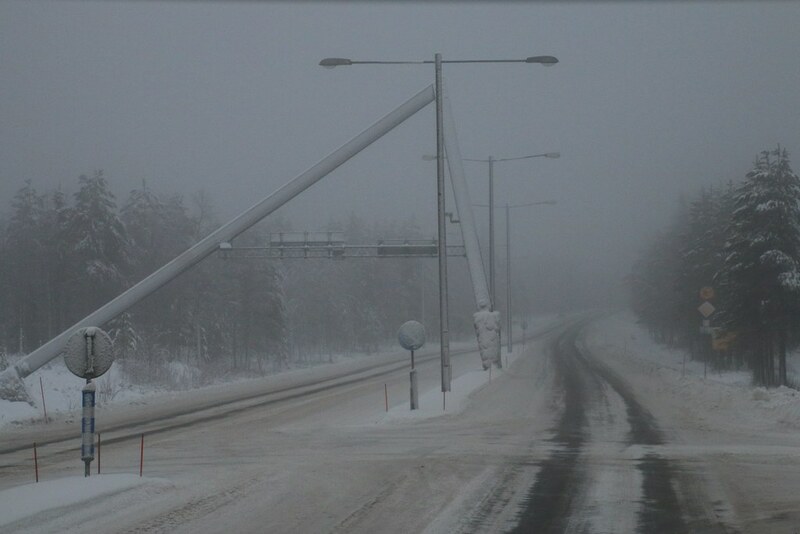 Finnish are so strong guys ever!! I’ve stayed with Rolf’s family over four days. They were so kind to me that I could take the rest well. He and his wife have one son in middle school and daughter in elementary school. 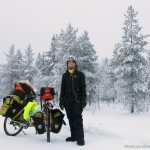 It was very interesting to see two of their children had cycled to the school every day alone in this freezing winter. 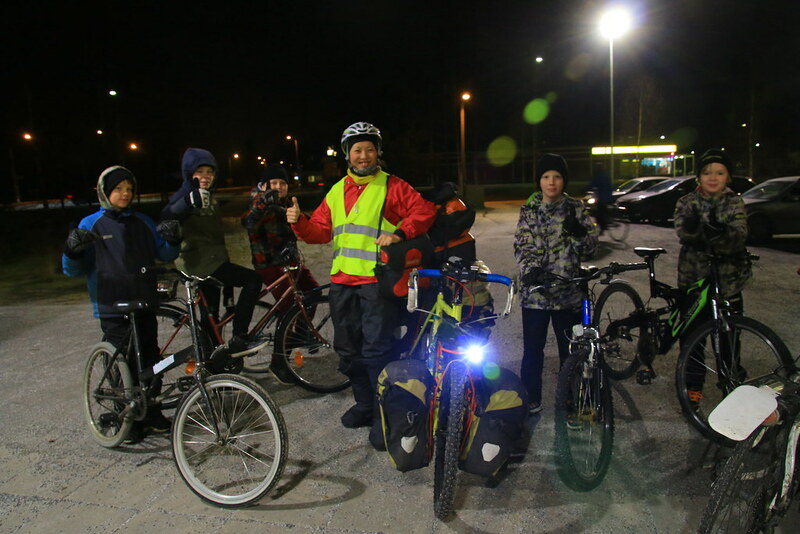 Sometimes they went out in the darkness with their bicycle to hang out with friends. Just Wow…. Brave..strong!! I borrowed the backpack from him. But I had too much things, so I used other bags as well. So, where was I going with the backpack?? I was going back to the north with a bus after leaving my bike at his house. I did want Aurora dancing which I saw in Canada. I’ve cycled in the north to see Aurora, but I saw only weak Aurora. So, I had looked for volunteering work in the north where I can see Aurora. Finally I got the answer from Korpikartano Hotel around Inari. I would volunteer there for a month. 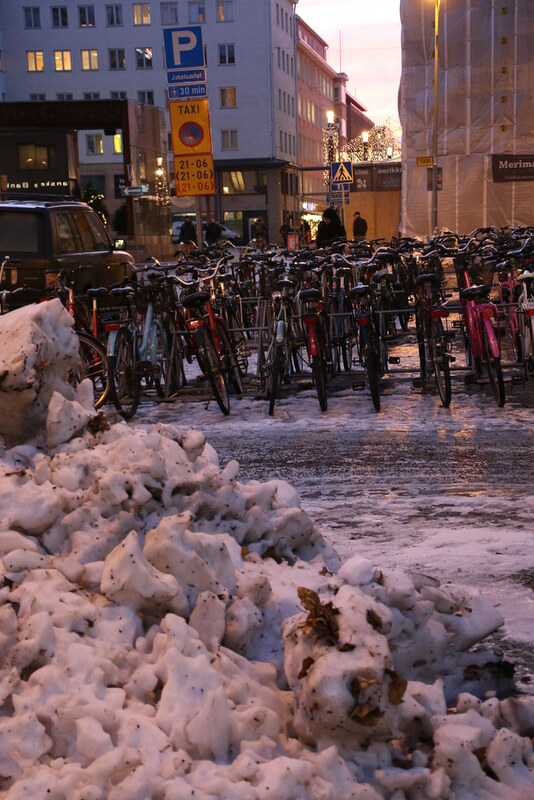 But actually it could be the problem, because after month it is the beginning of January, and it might be too cold to cycle again. Anyway the most important thing now was to see Aurora dancing!! Don’t’ worry and Let’s go back to Artic Circle! 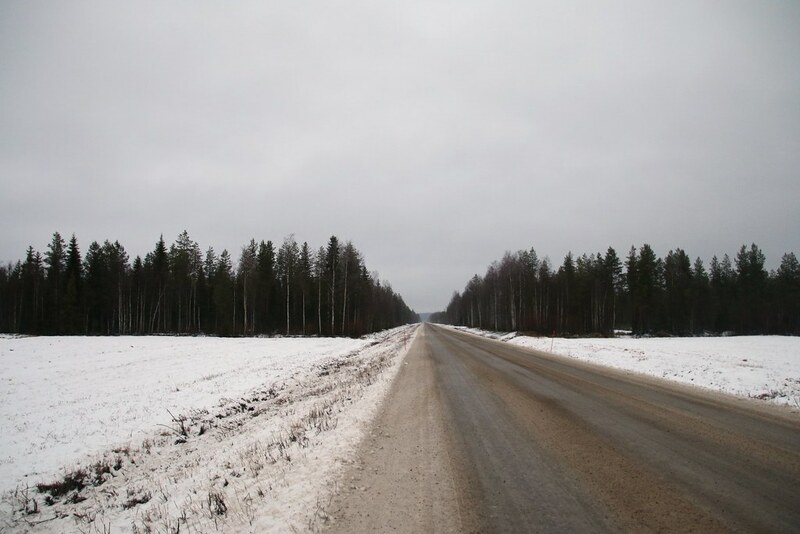 [14/11/27~12/05 (D+1192) Finland (to Oulu)] The country which gives the student 500$ for a month. (Finland) Unexpectedly, Finnish are so hospitable and kind! 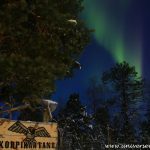 (Finland) Amazing memories in Korpikartano Hotel 1 - Where is Korpikartano? I do not see the apparent connection between suicide rate and level of student loans granted. Meaning, why there should be one. Of course it is cultural. I am a Finn and I know why this happens, and I don’t feel like discussing it. There you go. I thought Finnish would be much happier than South Korean, because in Korea many of people are struggling with too much competitive and stressful society. Some(or Many) of Korean want to immigrate to the country which has clean government, free education, less work time, and good welfare. So I was surprised to see the rate of suicide in Finland. Then I realized that suicide can be caused by cultural thing. This was the thing my posting wanted to say. Thank you for telling us your wonderful stories about this beautiful country and people. I am glad that I could share the story with you! you can be *forced* to do work for *free* at any time, for from 3 to 24 months at a time. they can also be daisy-chained, so you’ll do 3+3+3+3.. until you find a way out: real job elsewhere, become too ill, apply and get a pension..
it’s called “kuntouttava työtoiminta”, which actually is completely bogus, since only the ones who could do normal jobs are put in.. and compensation is the same unemployment benefit + 9 euros per working day for meals/travel/whatever – not nearly enough in an expensive country. if you decline, you will lose the benefits *immediately*. then your last recourse is social security from the city/town you’re in, but it will be the same amount MINUS 40% due to declining to work – even for free in many cases. if you own *anything* they think could be sold and used for a living, your application will be denied. so no cars, no stocks, no apartments other than the one you’re living in, certainly no cash over a few hundred euros in any account allowed. this is not all, but it is really intrusive in one’s privacy and mental health too. which reminds – they also ask the unemployed to go and see a doctor & other social service workers if they choose so – all of these will report back to the file they have on you. even single sentences which they think aren’t good in their opinion. a huge snitching operation that is.. Thank you for telling me serious real true fact!! 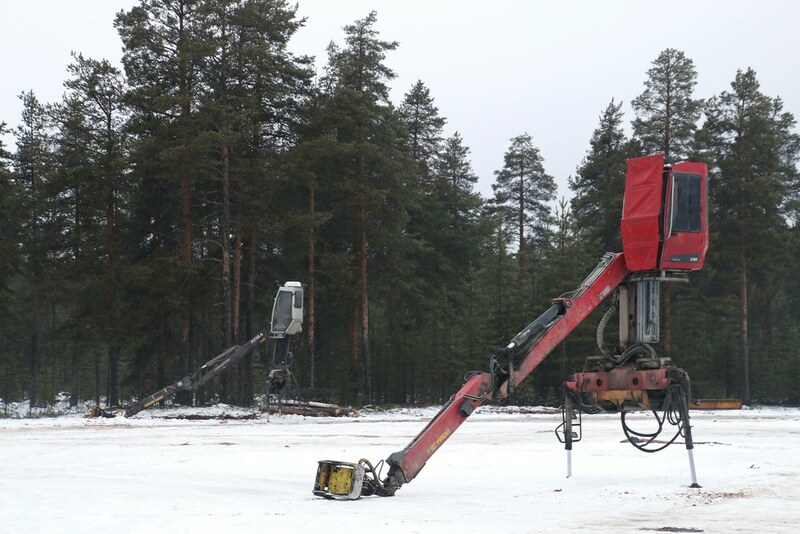 Machines in the picture are log lifters for timber trucks which as seen in the picture can be removed once the trailer has been loaded. This allows for loading more timber on the truck that could otherwise risk breaking the allowed weight limit. I saw many trucks with wood on the road. Smell of the truck was unique that I liked it!